New development, including the American Water building, arising along the Camden waterfront earlier this year. Liberty Property Trust has written down the value of its sprawling Camden waterfront development project by $26 million amid less-than-anticipated demand for office space at the site and the prospect that state tax breaks used for job creation there won't be renewed. 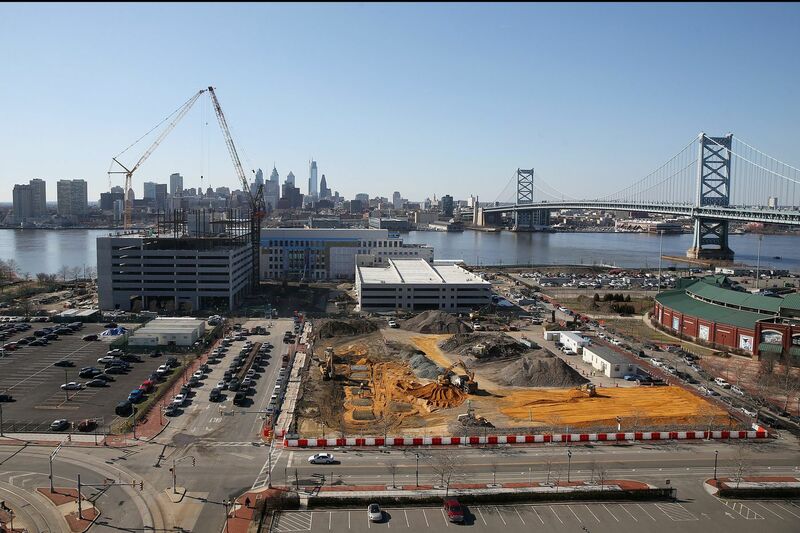 Liberty chief executive William P. Hankowsky said in a conference call with analysts Tuesday that the "impairment," accounting for almost a third of the company's $80 million investment, was necessary to accurately reflect the value of the Camden project under current circumstances. "We had a very strong business plan going in," Hankowsky said. "It just sort of basically hasn't played itself out the way we had anticipated." Liberty's announcement of its plans for the then-vacant 26-acre site across the Delaware River from Center City called for up to 1.7 million square feet of office space amid residences, hotels and shops. Liberty went on to build a new 207,000 square-foot headquarters for American Water Works Co. with a large parking garage at the site, and sold off additional parcels for a new tower to be occupied by South Jersey firms Conner Strong & Buckelew, the Michaels Organization, and NFI. Another parcel was sold to Michaels, which is developing apartments at the site, and Phoenix-based Ensemble Investments LLC is under contract to buy land from Liberty for a 180-room Hilton Garden Inn. But Liberty had built its business plan around the assumption that it could develop more headquarters for businesses seeking to relocate to the Camden waterfront, and those users failed to materialize, Hankowsky said. "The result of that is that capital that we thought would fairly quickly get recouped via the execution of those projects didn't happen," he said. The site's prospects are further dimmed by the possibility that the state's Grow N.J. incentives program, which offers tax breaks to companies that relocate to struggling New Jersey cities, won't be renewed when they expire next summer, Hankowsky said. Liberty has so far earned $42 million from its land sales and development activities at the site and believes it can earn at least $12 million through the sale of remaining vacant parcels, which can accommodate about another 500,000 square feet of development. But the potential loss of state incentives could be a setback as it seeks buyers for that land, said Jason Wolf, founder of Wolf Commercial Real Estate, a brokerage in Marlton. "The challenge for Liberty is going to be that the clock is ticking on the Grow N.J. program," he said. "Most of the big users that were looking to take advantage of those incentives have already come out of the woodwork." In addition to the Camden writedown, Liberty recorded a $60 million charge to account for cost overruns by its contractor at the Comcast Technology Center project that's opening this year. Those overruns were acknowledged in April and appeared on the company's balance sheet for the three months ended June 30. Liberty still may seek to recover some of those funds from the contractor, previously identified as LF Driscoll, through litigation or other means, Hankowsky said.